Yesterday, the United Nations University announced a case study on loss and damage (L&D) that it conducted in Nepal following the 2014 landslide. 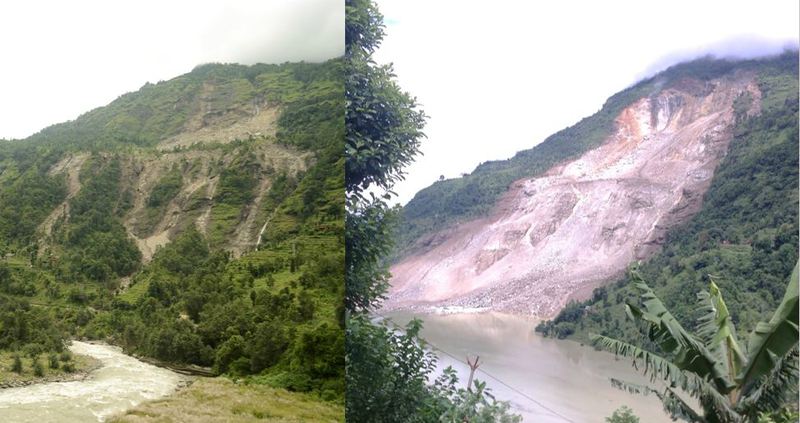 Overall, the landslides had a devastating effect on the community at large, blocking a highway, causing power outages, and killing more than 150 people; however, this study focused less on the overall effects and more on the individual community members’ coping mechanisms for the L&D caused before and after the landslide. The increased focus on lesser-known, community-level techniques is a great opportunity for governments and international groups to learn about smaller-scale L&D solutions. The panel, moderated by David Hewitt from UN Univeristy, included two presenters from UN University, Dr. Kees van der Geest and Dr. Robert Oaks, as well as Raju Pandit Chetri, who works for Nepal’s Climate Change Council. To begin the announcement, Dr. Geest presented on the study and emphasized that the goal of the study was to show the effects of L&D on the ground. In the study, researchers gathered evidence on what types of measures the landslide victims implemented before the landslide to prevent L&D as well as what the victims did after the landslide to restore their lives. Overall, the study found that the victims employed more reactionary efforts to clean up after the L&D but that more could be done to prevent and reduce L&D but these efforts lack “people-centered strategies.” Dr. Geest ended his presentation on the study by emphasizing that many people implement measures on the ground to address L&D but that these measures are not widely discussed. Perhaps this study can help shift the focus to these on-the-ground measures and bring them to the forefront as viable L&D mechanisms. Following Dr. Geest’s description of the study, Chetri spoke about the study’s impact on Nepal. He first explained how there are limited scientific studies available in Nepal that help demonstrate the country’s need to go beyond adaptation measures to address L&D and this study helps to fill this void. Chetri also emphasized that events like this are likely to increase with changing and unpredictable weather patterns in the face of climate change, which makes studies like this more important in order to show countries like Nepal how to react to these types of events in the future. In the question and answer portion of the conference, the moderator asked Chetri about the link between academic studies like this case study and on the ground projects. Chetri explained that negotiations on L&D often seem abstract but that these studies demonstrate in a tangible way that L&D is happening now—not just in the future. Additionally, he explained that these studies direct governments on what types of policies and programs to put in place in order to reduce on-the-ground effects, further underscoring the study’s importance to on-the-ground application of L&D mechanisms. The final presenter, Dr. Oaks, ended the announcement by discussing the cultural L&D climate change can cause. While admitting that cultural L&D is difficult to quantify, he underscored its importance to communities, and in some instances whole countries that may be displaced due to the effects of climate change. This further emphasizes the importance of L&D studies like this one, which could educate those working on L&D, helping them understand the individual community members’ views on displacement and ensuring that “migration with dignity” remains an option. The views and feelings of individual community members are just as important as theoretical discussions about national or international approaches to L&D to develop comprehensive strategies to address L&D. Too often, L&D focuses on large-scale, national, or international solutions to L&D, but the real impact of L&D is felt on an individual basis in small communities across the world. This case study refocuses L&D research around these communities. This entry was posted in COP22, LDCs, Loss and Damage, Warsaw International Mechanism and tagged climate change, COP22, Loss and Damage, UNFCCC. Bookmark the permalink.